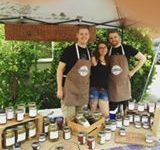 Jargon Preserves is a small-batch pickles, jam and preserve company whose products are created by two Ottawa chefs with local ingredients. Our products all have a unique and delicious twist to them. So whether you have more of a sweet tooth or a savory palate, Jargon Preserves will have something to cater to your tastes and make you fall in love with the art of pickling and preserving. Additionally, all our products are vegan, gluten-free and vary with the seasons to better showcase the bounty of Canadian fruits and vegetables.